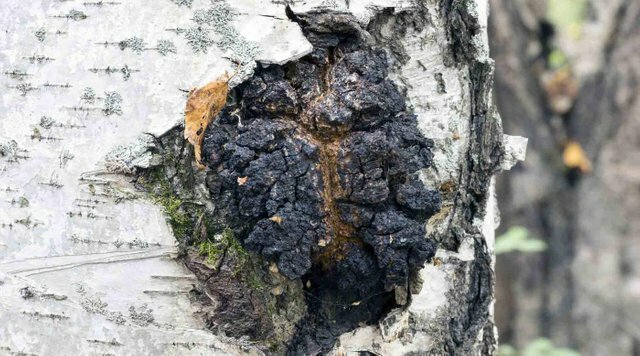 The Chaga Mushroom is another medicinal wonder that is found almost exclusively on birch trees. Much like the Birch Polypore, this fungus is found all year round in the northern hemisphere. 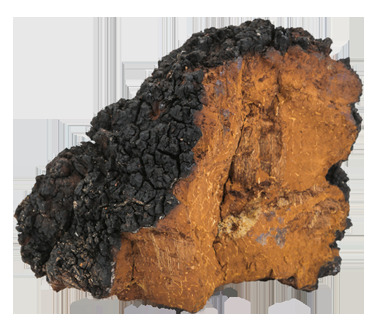 Moreover, the Chaga mushroom has also been revered for thousands of years due to its magnificent medicinal properties. 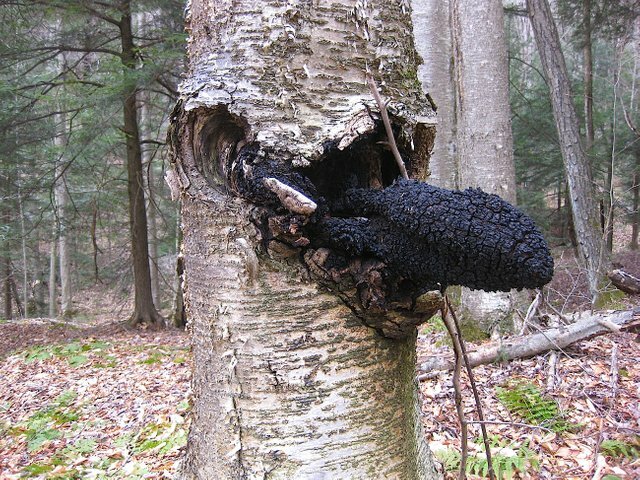 The Chaga mushroom doesn't look like anything else that can be found on a birch tree! The fungus has a black, cracked exterior and a yellow to a yellow-brown interior. It would be very difficult to describe the shape of this particular fungus as it will often look very unusual and could be a completely different shape to a Chaga fungus growing on a neighboring tree. The medicinal properties of this fungus are almost endless! The fungus has had a significant place in Siberian folklore and herbalism where it was used in a medicinal tea to boost physical endurance and live longer. Today, it is still most commonly used in a tea and can fetch quite a hefty price on the market. This fungus is very high in super-oxide dismutase (SOD) which reduces the damage that "super oxide", the most common free radical in the body, can have on the cells. This is particularly useful because as people age, the number of free radicals in the body increases, while the levels of SOD drop. SOD acts as an antioxidant and anti-inflammatory, which is now being researched for its potential anti-aging properties. The Chaga mushroom is also helpful in boosting the immune system. The fungus, as with most other medicinal fungi, is rich in 'beta-glucans, a powerful and potent polysaccharide that is known for activating the immune system and helping people who suffer from abnormal peaks of blood sugar to keep levels of sugar in the blood down. The Chaga fungus is also seen as a wonderful adaptogen. Adaptogens are phytonutrients that allow the body to adjust to stressful events or circumstances such as extreme temperatures or trauma. The fungus even has a reputation for being anti-viral and will help to lower cholesterol levels. To make your Chaga tea, simply take a chunk of the fungus and brew it in a small pot of water at no higher than 80 degrees Celcius (176 F) for quite a while. If you are patient enough, an hour of brewing will provide a deep and concentrated tea that will be packed with loads of healthy medicinal benefits! Don't throw the chunk away, you can re-use it. In fact, you can typically use a chunk of Chaga untill the color of the fungus fades; usually after about 20 brews or so. A wonderful post. Very well articulated and put together. Keep up the great work. That's a shame. I wonder if you guys have the Birch Polypore in Australia. It also grows exclusively on birch trees and has many wonderful medicinal benefits. Thank you! I find that even though it could be used up to about 20 or so times, the best flavour comes out of the first 10 brews. Thanks for that. I looked around just a little around my parent's property... didn't find any but they don't have very mamy birch trees!